Jared Kushner, Donald Trump’s son-in-law and a senior White House advisor, is a focus of the investigation of links between Trump associates and Russian contacts, according to “multiple US officials”. The US officials had said last week that an advisor who was politically and personally close to Trump was a target in the inquiry, but had not named Kushner. See Senior Trump Advisor is “Person of Interest” in Russia Inquiry — Is It Jared Kushner? However, the sources have now told NBC News that investigators believe Kushner has significant information relevant to their inquiry. He is not necessarily suspected of a crime or facing charges, the officials said. 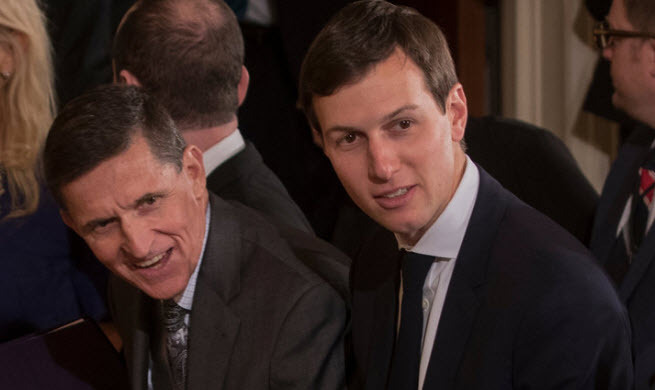 The sources said Kushner is in a different category from former Trump campaign manager Paul Manafort and former National Security Advisor Michael Flynn, who are both formally considered subjects — “a person whose conduct is within the scope of the grand jury’s investigation” — of the inquiry. Grand jury subpoenas have demanded the records of Manafort and Flynn. The former campaign manager has said he will comply. Flynn has refused, invoking the 5th Amendment against self-incrimination, so the Senate Intelligence Committee has now issued a subpoenas for documents from two of his businesses. Kushner met Russian Ambassador Sergei Kislyak in late November, and he also had a discussion with the head of the Russian development bank, Vnesheconombank, which has been under US sanctions since July 2014. He initially omitted the contacts from a national security questionnaire, with his lawyer Jamie Gorelick later saying that Kushner submitted the form prematurely and had informed the FBI that he would provide an update. Justice Department spokeswoman Sarah Isgur Flores said, “I can’t confirm or deny the existence or nonexistence of investigations or subjects of investigations.” The FBI declined to comment. Donald Trump unsettles NATO allies not only with his repeated demand that they contribute more to the organization but also with his failure to support collective defense. Trump’s chiding of NATO members for not reaching the 2% of GDP threshold for contributions — a target which is to be by 2024 — was not unexpected, even though he was mistaken when he said “massive amounts of money” were “owed” to the US and the organization. What was surprising, in light of advance briefing by American officials, was the lack of any reference to NATO’s Article V committing all to defense of each other. NATO members had set the scene for a reaffirmation by inviting Trump to unveil a memorial to the victims of the September 11, 2001 attacks, located at the new NATO headquarters building in Brussels. Terrorism must be stopped in its tracks, or the horror you saw in Manchester [a bombing in northwest England on Monday that killed 22 people] and so many other places will continue forever. These grave security concerns are the same reason that I have been very, very direct…in saying that NATO members must finally contribute their fair share. Trump also made a surprise call for NATO to include the restriction of immigration amongst its core duties. NATO Secretary-General Jens Stoltenberg defended Trump, saying that while “blunt”, he had “a very plain and clear message on the expectations” of allies. Further discord was spurred by Trump’s behavior at the meeting. He declared, “The Germans are bad, very bad. See the millions of cars they are selling in the US. Terrible. We will stop this.” And he was caught on video pushing aside the Prime Minister of Montenegro, which joins NATO in June, to get to the center of a photograph. A federal appeals court upholds the suspension of the Trump Administration’s ban on entry into the US by refugees and citizens of six mainly-Muslim countries. A 10-3 ruling from the 4th US Circuit Court of Appeals upheld the indefinite block on implemntation of the order, first issued in late January and re-issued in a revised form in March after it was initially checked by a federal judge and then a circuit appeals court. The evidence in the record, viewed from the standpoint of the reasonable observer, creates a compelling case that primary purpose is religious. Then-candidate Trump’s campaign statements reveal that on numerous occasions, he expressed anti-Muslim sentiment, as well as his intent, if elected, to ban Muslims from the United States.